Many times over the past two years we’ve discussed a common record company practice of coming up with exploitative or intriguing titles to their instrumental releases in hopes of drawing some interest. This can be seen as a necessary move since these records are lacking in lyrics which is where most song titles are usually derived from. You have to name the songs something after all just so the tiny little men who type out the tiny little labels for the records in jukeboxes feel needed. But no matter how clever or unusual these song titles are they don’t really have any real connection to the contents of the record. They’re not descriptive in any way, just a form of advertising… a word or two designed to piqué the interest of somebody who might be curious to see what a song named after a side dish for a plate of barbecue tastes like… err… SOUNDS like. There’s nothing altogether deceptive or unethical about this really… well, except maybe if you affixed a title to a song that actually HAD lyrics that sort of refuted the premise that title implies. Such was the case with Sonny Thompson, an artist who’d released nothing but instrumentals prior to this and therefore might not have been made fully aware of the implications for giving a Christmas title to a song that was hardly about the holidays in any conceivable way. It’s a weird thing about Christmas songs, we have a sheaf-full of them dating back centuries that we haul out each December and sing or listen to with a wistful sense of longing for some innocence they’re supposed to conjure up even though the circumstances they often describe are completely foreign to us… if not made up altogether, or did you think the ones about flying reindeer with electric noses and walking, talking piles of molded slush with buttons for eyes were based on true events? We don’t do this for other months of the year. Maybe the multitude of versions of George Gershwin’s Summertime get played a few more times from June to August than in mid-February, but it’s not as if radio stations are setting aside time for it each year when the weather turns hot. The same is true of something even more frequent, like the days of the week. You’re just as likely to hear The Mama’s And The Papa’s Monday Monday on a Thursday or Elton John’s Saturday Night’s Alright For Fighting pouring out a radio on a peaceful Wednesday morning as you are on the day they’re describing in their lyrics. Yet even the most popular Christmas songs are rarely played in July even though hundreds, if not thousands, of Christmas songs are in regular rotation on radio for a month every single year, so much so that many of them re-make the singles charts each December… and this for records that are in some cases more than a half century old! That doesn’t happen at any other time of year for any other type of music. 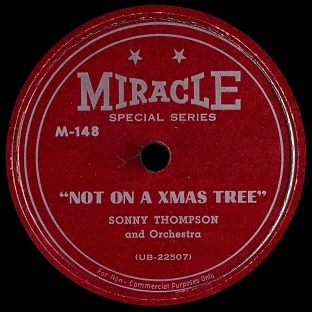 So Sonny Thompson might have actually been a little cagier than we’re giving him credit for by slapping a Christmas title to a song that otherwise is completely unaffiliated with the holiday and all of its associated secular or religious images, or even random wintertime scenes for that matter… unless you want to say that the cold diss to a woman that comprises up the story for Not On A Xmas Tree is somehow chilly enough to conjure up images of Jack Frost. Just so you don’t think we’re going to pull a fast one on you and reveal down the line that this IS a little more Christmasy than we’ve made it out to seem, the fact of the matter is while the chorus’s punchline is indeed the revelation contained in the title line, as Sonny tells us he “wouldn’t have this woman up on my Christmas tree” it really doesn’t make any SENSE. Would he have hung a beautiful woman he loved with all of his heart on a Christmas tree? Even if he had wanted to how would he have done it and would she have actually been agreeable to such a bizarre act? If not, then what kind of a rejection of her gets its bite from denying her a spot next to some tinsel and colored lights? All of which makes the song that much more devious if you ask me. He’s making a play for your wallet in a bold guilt-free fashion, hinting with the title that this is a song you’ll be happy to listen to while roasting chestnuts on an open fire in between the latest offerings from Gene Autry and Perry Como, when in fact it’s nothing of the sort. There’s not even the whiff of goodwill or holiday cheer to be found on Not On A Xmas Tree. In fact there isn’t even the well-used device of lamenting about spending the season without someone to cuddle in front of the hearth while sipping eggnog. Nope, this is a two minute and fifty second BURN of somebody who would’ve much preferred getting coal in her stocking rather than have the world hear about her foibles as a woman. But since we have no compunction about furthering her humiliation by writing about those details here, something we can justify because it’s our job to discuss lyrics in these reviews, and since her name is never mentioned that helps to further alleviate our guilty conscience, here’s the basic rundown about this woman who apparently has quite a crush on Mr. Thompson that by all accounts he is not about to reciprocate. Where should we start? How about the fact she has one blue eye and one brown, an unfortunate condition called Heterochromia which she shares with songwriter Jerry Leiber. It didn’t stop him from penning the lyrics to dozens of the most witty songs ever written and while Leiber could be quite sharp in his own critiques of a subject’s imperfections in his most humorous work he never turned the tables on himself and brought up this malady for a laugh. But that’s a medical quirk not a character flaw so Thompson makes sure we know that it’s far from her only physical oddity. She’s also bald, and not by choice, toothless and suffers from a flat head, she stutters and apparently the poor gal might even suffer from vertigo by the way she wobbles… unless that’s due to her lopsided proportions which include “arms like a blacksmith and feet like a bee”, which I suppose WOULD make it hard to maintain her balance at that. You’ll notice however that all of Thompson’s snide remarks about this girl center on her physical appearance which – in the spirit of Christmas – forces us to remind him that it’s what inside that counts. He’s alluded to the fact that she loves him more than anything and I’m guessing that with her looks she’s going to try and make up for it by being sweeter, kinder and more caring than a lot of bombshells who know they can treat their men like dirt because they have so many suitors they can damn well do as they please without fear of being alone because of their bitchiness. So assuming that this unfortunate girl is a goodhearted creature who only wants to make Sonny happy we start to feel a little sorry for her, especially since she’s sure to feel the sting of rejection and loneliness more acutely this time of year, left standing alone under the mistletoe, an ugly duckling without a swan. While we in no way condone Thompson’s cruel and unusual punishment inflicted on somebody who only made the “mistake” of falling for him – though considering the mediocre records Sonny’s put out over the past year maybe he shouldn’t be so picky… after all this isn’t 1948 when every girl was beating a path to his door, but I digress – the fact is that Thompson delivers this cold-hearted appraisal in a very laid back manner. In other words he’s not throwing in any added vitriol with a mocking sneer or the evil cackle of a cartoon mad man. Now granted maybe that’s not enough to mollify your sense of fair play when it comes to publicly shaming someone who has done nothing to deserve this embarrassment, but if it’s possible to sound fairly charming and even reasonable in singing these things then Thompson’s mellow tone might qualify in that regard. Besides, his own off-handed malice is not our primary concern as rock ‘n’ roll historians, we’re more interested in the other aesthetic qualities of the record itself and this is where we have to commend him. Musically Not On A Christmas Tree (as I’m sure it was shortened from to fit better on the label) shows Thompson making great strides to rebound from the lackadaisical efforts he submitted on Dreaming Again and Backyard Affair last month, which were among his weakest records to date. Now granted today’s record is hardly a return to the addictive grooves of Long Gone or even its de facto sequel Still Gone, but all things considered this has enough of a distinctive feel to it – with his slinky piano lead and some subversive guitar lines tossed in – to be worth a few spins for the music alone, even without the snarky lyrics. For one thing this finds Thompson in a bluesier mode than we’ve seen him before, not quite approaching the cocktail blues motif that was still riding high in the black community, but not all that far off from it in many ways. Maybe that form was something he might’ve otherwise been inclined to pursue if he’d found himself a smooth vocalist – since his own vocals here, while effective for the content, have obvious limitations. Most cocktail blues groups were led by singing pianists but hearing this you could certainly envision pianist Thompson holding court at the nicer clubs with a nice trio behind him provided he found a guitarist or bass player to handle the singing full-time. But of course that wasn’t in the cards, nor do we know if he was even contemplating such a move. Not On A Xmas Tree is just remotely connected to that form anyway and replaces the dreamy atmosphere and lyrical dejection of cocktail blues with a snide cockiness underneath the tranquil delivery. A wolf in sheep’s clothing, or if you prefer a Grinch in a Santy Claus hat and a coat. Unfortunately for Sonny Thompson neither side of his faux Christmas record even made territorial charts, which is somewhat surprising considering his still lingering name recognition from the year before and the influx of rock acts who DID score this season with Christmas tunes. But far from being a fruitless exercise these two Christmas sides did seem to refocus Thompson when he most needed it. Though by no means a strong unapologetic rocker that stated to the world he was once again going to try and grab the headlines he’d once held and since relinquished with a series of milder subsequent releases, Not On A Xmas Tree did manage to point the way to an acceptable middle ground where he could remain firmly entrenched in the ever broadening rock landscape while continuing to explore a more varied output than merely the groove-oriented instrumentals he’d made famous. Those earlier records of course would still remain his crowning achievement but at least now there was some indication that he’d reconsidered his move towards a less urgent pop sound and realized his best bet was to focus on satisfying the audience that got him this far to begin with. If that moment of awareness as to his place in the world made him just a little bit conceited, enough to snub a harmless innocent girl, well, I suppose even that fits in with the rock star image too, as distasteful as it is. So while we welcome Sonny Thompson back to the fold, his eyes focused more intently on the music we need out of him, let’s show some holiday spirit and track down this “ugly woman” he’s badmouthing and buy her a fruitcake for Christmas. Leave a reply on "Sonny Thompson: “Not On A Xmas Tree”"